It has begun - the dreaded teething stage. My relaxed, peaceful baby has gone and has been replaced by a whiney, drooly, teething monster. Ok, maybe I am exaggerating a little but when she won't settle for her nap and is putting everything she can lay her hands on in her mouth, that's how I feel. The worst part? I can't even see the teeth yet. The health visitor said they are probably just moving about in the gums causing her discomfort. But how long will this last? Will she ever get a tooth and return to the chill kid that I know and love? It has been a month of teeth moving around the gums and I feel like she may be 18 before the tooth makes an appearance. I am despairing. But, in this anguish, I have managed to find some solutions - well, things to stop her howling quite as much anyway - and that is what I am sharing with you today. 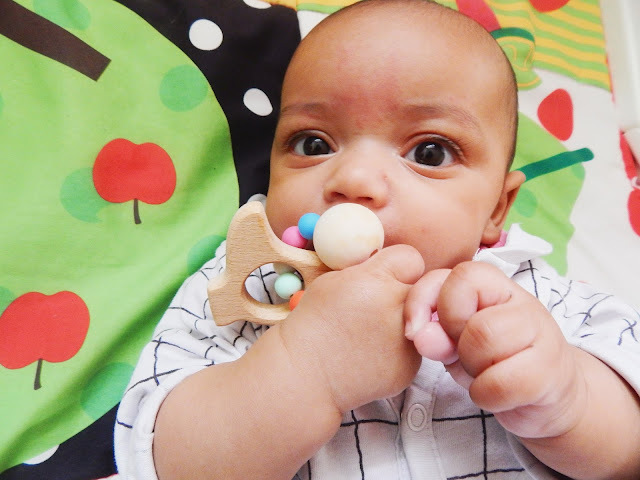 The lovely people at Bespoke Baby London recently sent me out a wooden teething ring for Ava and it is an absolute godsend. 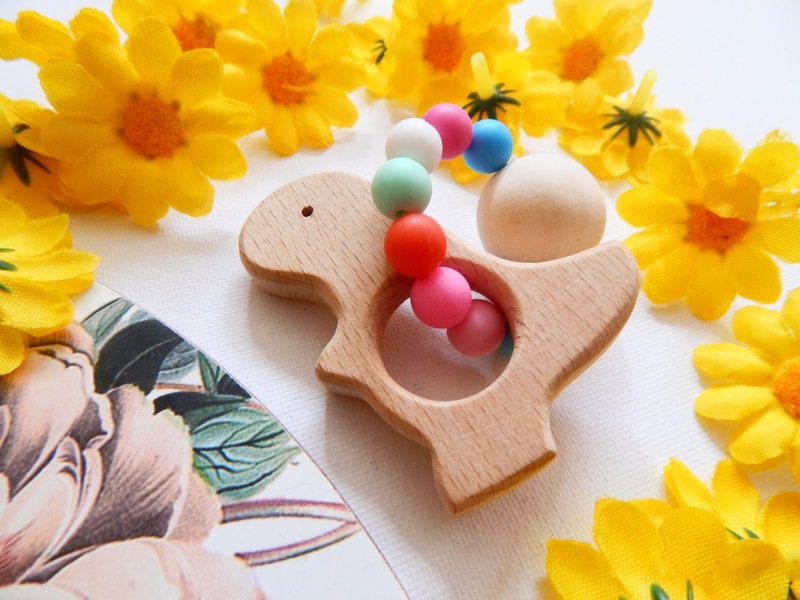 It has a ring of little rubber balls that Ava loves to chew on and it is just the right size to fit in her hands. I have tried other teething rings (the type you put in the fridge) but they're all too big for her to hold and she didn't like the bobbly plastic texture of them. So, this toy is the perfect solution. Also it is a great size to pop into your bag when you go out. Being a first time mum, I wasn't really aware that teething gel even existed until my mum bought me some for Ava. I kinda smirked at her saying that Ava won't be teething for a long time yet. A couple of weeks later, she started drooling like a trooper and I realised that the teething gel was actually very necessary. For the first two weeks of teething, it was the only thing that would pacify Ava - especially in the night when she woke up screaming. I tried it on my own gums just for fun (I like an exciting life) and it was really tingly and numbing so I can say this is definitely a tried and tested product. In terms of brand, I just get whichever is cheapest. After Ava out and out refused the cold teething toys, I got a bit inventive. I knew the coldness would be soothing on her gums so I tried putting a dummy in the fridge and she loved it. She took it straight away then had a long nap. It was perfect. I swear by those bibs that are normal at the front but having a plastic back. I pick them up in Primark and they are amazing. I found that normal bibs just let the milk (or, in this case, baby slime) seep through and then her sleepsuits keep getting soaked. But these bibs hold a lot more liquid so I would highly recommend them. My only tip is if you are someone who likes to hand wash clothes (I know it's the 21st century but we didn't used to have a washing machine) then these aren't that easy to wash. But pop them in the washing machine and there's no issue. Let the baby co-sleep with you if they are really unhappy. Give them hugs and let them forgo tummy time if they don't feel like it. Routine is good for babies but sometimes all they want is their mum. What are your teething hacks?